My name is Ringo, although I'm not sure if it's because I'm such a rock star or if it's because I have rings on my beautiful tail! I lived on my own for a long time, and several people tried to catch me. Most of them weren't successful, but one young lady managed to snare me. She took me to the vet, and I was vaccinated (ouch!) neutered (whose idea was that? ), and loved (YES!). I stayed at the clinic from October until December because there was no place else for me to go. I was a bit shy when I first arrived there, but the vet techs played with me when they could. Since coming to Red Fern, I have made many, many friends, both two-legged and four. I am great with kids too! I'm no longer at all frightened of people, and I can't wait to belong with someone special. As a bonus, I enjoy walking and am good on a leash. The people at Red Fern tell me every day how much they love me and what a good boy I am. They say I am a calm and happy boy! I know that someone is going to say, 'That's the boy for me!' very soon, and I'll be packing my bones and heading out. Today could be that day! Ringo's adoption fee is $200.00. 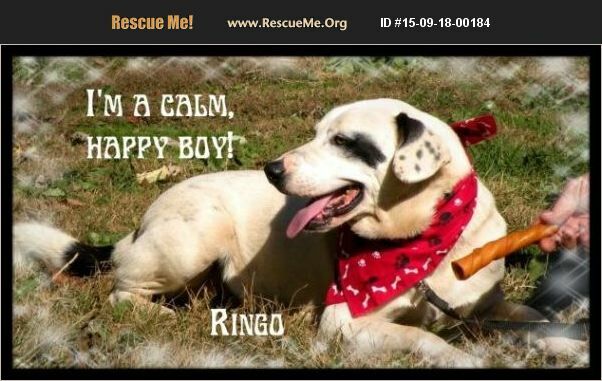 If you are interested in becoming Ringo's person, please submit an adoption application. Someone from Red Fern will contact you and answer any questions you have about Ringo. Thank you! ***This beautiful dog is currently in a shelter but has received full vet care and we will provide FREE volunteer transport to a foster or forever home�'�|please don't let that stop you from adopting! We are accepting applications to adopt each of the Tennessee dogs listed so they can get out of the shelter. **Rural Animal Rescue Effort is a foster home based rescue - we do not have a shelter or kennel facility nor do we have regular hours when our companions can be seen. For the safety of our foster caregivers and our animals, applications must be submitted and references checked prior to setting an appointment for a Meet and Greet with our dogs in our foster homes. ** All of our dogs have some potty training under their belly, however, dogs less than 8 months of age are not considered reliably potty trained. All of our dogs are up to date on vaccinations, including rabies if they are old enough. Microchipping is included in the adoption fee. Adoption fee covers: All age appropriate Vaccinations, including rabies (if old enough) Worming Flea treatment Spay or neuter surgery Pre-surgical blood work Post-surgical pain management Microchip Rural Animal Rescue Effort provides safe transport of all our animals to their new homes unless other arrangements are made.